Some nights you just don’t want to cook but bringing your young kids to a restaurant with you can quickly turn into a nightmare. Even the best-behaved kids can be unpredictable and you don’t want to ruin anyone’s night. So many moms are afraid to take their kids out to eat, either going to a kid-friendly restaurant with a limited, junk food menu or skipping the whole experience for the drive-thru. However, you shouldn’t be afraid to take your young children out to eat. Going out to eat is a fun way to teach your children social skills, expose them to new foods, and just enjoy some quality time. You just have to be prepared. 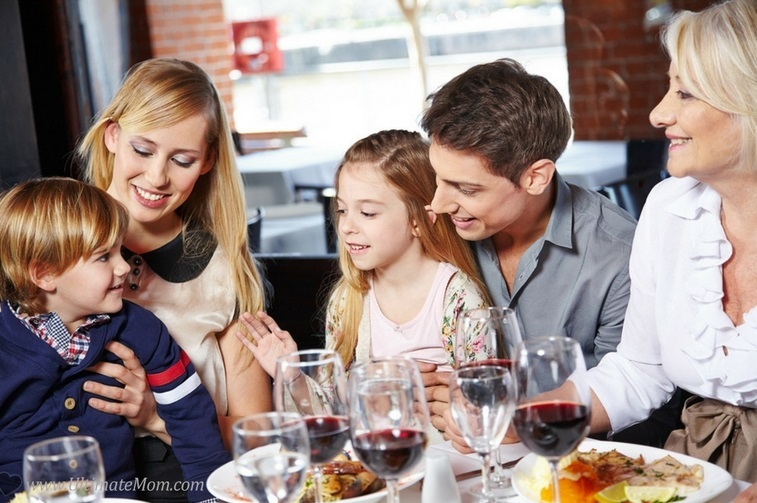 So here are some tips so you and your children can have a stress-free night out at your favorite restaurant. Before going out, you want to make a great plan. First, make sure children are allowed at the restaurant you’ve picked. With so many complaints and all the disruptions, some restaurants have started to incorporate “no children” policies. Next go over the menu and figure out what items your child will love that way you can be prepared to order and don’t have to try to juggle watching your children and deciding what everyone’s going to eat. Most restaurants nowadays have their menus posted on their website. You can also find them on review websites like Yelp and OpenTable, or you can simple call and ask the host or hostess. Finally make a reservation ahead of time and let the restaurant know you will have children with you. That way they can seat you in an area where any noise won’t bother the other guests and will have any booster and high chairs ready. Practicing manners at home can help your children feel more confident at a restaurant and helps them understand what to expect. Before heading out to a restaurant, try doing a trial run. Go through everything you will do at a restaurant from seating them at a table, deciding what to eat from the menus, and how they will be served. At every step explain what will happen and how they should respond. 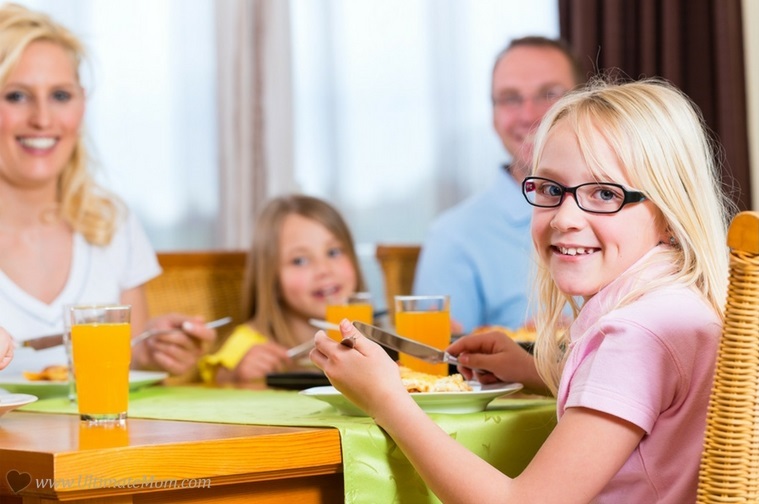 Doing a trial run at home is a great way to teach your children restaurant etiquette and practice their table manners. It can also be a fun way to spend a meal together. Once you are ready to go out, try to pick a time where the restaurant is less busy like during the week or at off hours. One of the biggest things that can make going out to eat with your kids a nightmare is making them wait. During peak business hours restaurants can be slammed. First you will have to wait to be seated at a table, which can make your children antsy and hungry. Then it will take much longer for your food to come out which means you’re tired, hungry children will have to exercise even more patience. All this waiting is a recipe for a tantrum. Plus, busy restaurants are loud and full of intense stimuli, which can be overwhelming for young children. That added stress can make the experience tenser than it needs to be. Not to mention, if you go when there are less people, if something does happen and your child has a tantrum, you’ll disturb less people, which means less stressful hostility from the other patrons. Not every restaurant is going to have something to entertain like coloring menus or small toys. Even those that do, your child might tire quickly of these activities and get antsy while they wait for the food to come. So instead of relying on the restaurant to provide them with entertainment, pack a “busy bag.” A busy bag is a small bag with a few games, toys, and activities. Having a few different ways to play will keep your child from getting bored and acting out. Plus, you can bring some games you can do together so you can make the most of your quality time. Finally, don’t be afraid to pack a small snack in your busy bag. That way if the food is taking a long time, your child can have something to tide them over so they don’t have to get hungry or cranky. As they say “the best defense is a good offense,” so consider inviting another adult out with you. This is a great strategy when you are first taking your children out to eat with you. If there are two of you, you can better entertain your children and give them less opportunities to act out while you are distracted. Also if you have another adult with you, if something does happen, easily you can take your kiddos for a quick breather while they hold down the table. Plus, if you go to dinner with other adults, your children will see firsthand how they are supposed to act at restaurant because there will be two of you modeling the correct behavior. The next time you want to go out to eat with your kids consider inviting a good friend or a family member to join you. Sometimes we do everything we can but our child still ends up having a tantrum. If that happens, it’s okay. First of all, don’t be embarrassed. Anyone with children knows that sometimes things happen. No one expects your children to be perfect. If your child has an accident and makes a mess, don’t feel bad or freak out. You can always just add an extra couple of bucks to tip to make up for it. If your child has a tantrum, stay calm and take them outside or into the bathroom to diffuse the situation. If your child is acting up, don’t be afraid to discipline. If you can’t get your child to settle down, don’t be afraid to leave at any point. Always remember, these things happen and it’s okay when they do. The only time that they are ever really disruptive is when parents don’t try to diffuse the situation. These simple methods will make sure that when you take your children out to eat, you both with have a fun and tantrum-free night. So the next time you don’t feel like cooking or just want to try a new restaurant, go ahead and bring your kids! If you go prepared, you will have a great time.